Thanks to members of the Wyss Bioinspired Robotics platform, thousands of young minds have likely absorbed a key point about robots — they can do more than just spy on people. Through video demonstrations, hands-on activities, and touchable prototypes, a new generation of budding scientists and engineers have been introduced to a world of robotic possibilities well beyond the hidden cameras and recording devices they’ve seen in spy thrillers. 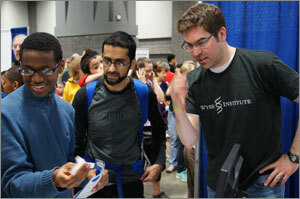 Kevin Galloway talks robotics at the USA Science and Engineering Festival in Washington, DC. The educational outreach is the result of a collaborative effort between the two arms of the Bioinspired Robotics Platform: Radhika Nagpal’s Self-Organizing Systems Research Group and Rob Wood’s Microrobotics Lab. 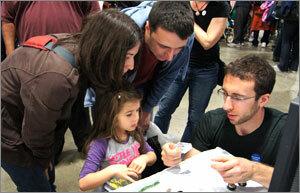 Members from both groups participated in four major educational forums in April: a Robot Block Party at the Boston Museum of Science, the Science Carnival at the Cambridge Science Festival, a Biomimetics Showcase at the MIT Museum, and the USA Science and Engineering Festival in Washington, DC. In each instance, the goal was to encourage students from kindergarten through twelfth grade to get excited about science and engineering. To that end, many cutting edge technologies were featured at each event. There were robotic bees that might one day assist dwindling bee populations in pollination duties; squishy, soft robots that can crawl around obstacles and might one day be used to search disaster sites; and toy-sized robot construction workers that can build structures much larger than they are and might one day be able to pile sandbags into a barrier against floodwaters. In addition to these public exhibitions, the educational outreach effort includes visits to individual classrooms in Boston and Cambridge to give talks and stage demonstrations. While the outreach efforts are meant to be exciting and fun, they also serve a very serious purpose — helping ensure that the scientists and engineers of the future are well prepared to develop innovative solutions to our growing global challenges. Under the leadership of Ben Finio, a graduate student in Wood’s lab, there were about 20 such visits over the last year for students ranging from second graders to high school seniors. Ben Finio (bottom right) has led about 20 outreach visits over the past year. The Bioinspired Robotics Platform was also represented at the recent Museum of Science event “Inspiring Minds: Meet Women in Science.” Rebecca Kramer, a graduate student in Wood’s lab, explained her research and demonstrated the construction prowess of so-called termes robots at this forum on the challenges and opportunities of being a woman in science. Many Wyss community members have contributed to the success of this educational outreach effort. They are Postdoctoral Fellows Mirko Kovac and Mike Tolley, Academic Fellow Kirstin Petersen, and Advanced Technology Team member Kevin Galloway. Also helping have been postdoctoral students Karthik Dantu, Nils Napp, and Mike Rubenstein; researcher Christian Ahler; and visiting scholar Adrian Cabrera — all from Nagpal’s lab.